A Terex RT 90 rough terrain crane was used by Nabors at a construction site in Abqaiq, Saudi Arabia. A lowbed trailer was used to transport the crane 200km to the work site; no additional transport vehicles were required. The RT 90 was continously working for five months, lifting numerous components for drilling rigs, generators, and a power distribution and control center at the oil field. 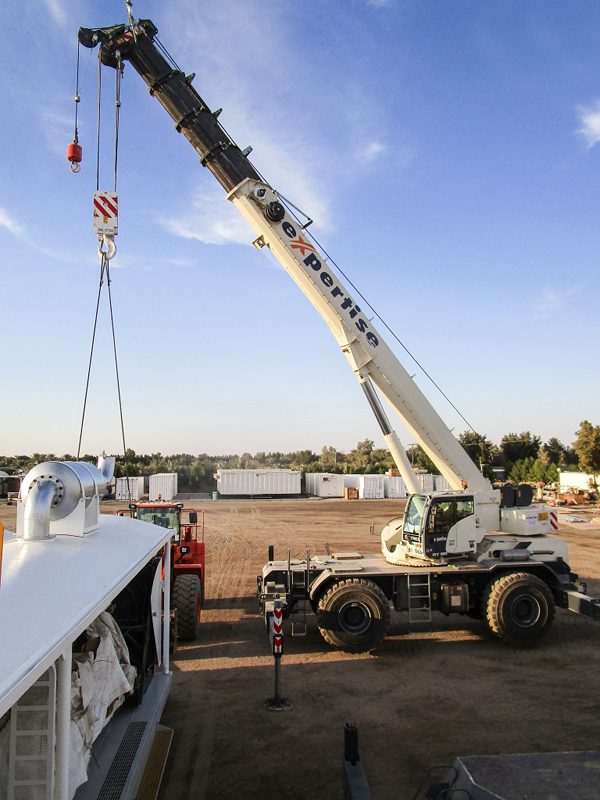 The rough terrain crane completed most of the lifts solo, and only needed assistance when lifting a 60t steel container that housed the power distribution and control center for the drilling zone. For this particular lift, a Terex RT 780 rough terrain crane came was deployed to complete the task as a tandem lift. “For this project, we needed a heavy-duty, reliable crane that not only combined a large lifting capacity with excellent maneuverability under tight space conditions, but that would also be ready to start working at the drop of a hat,” said David Siljeg Nabros Drilling Manager while describing the requirements that his company had when contacting Saudi-Arabia-based heavy equipment service provider Expertise Contracting Company. As is the norm every time a crane is used for the first time, Terex Cranes’s team members were present at the desert job site in Abqaiq in order to instruct the customer on the new machine. More specifically, they provided assistance with the crane’s commissioning and operation. At the same time, they took advantage of the opportunity to study the crane’s performance under specific job site conditions in detail.